What to do when the groove of your life starts feeling like a rut? 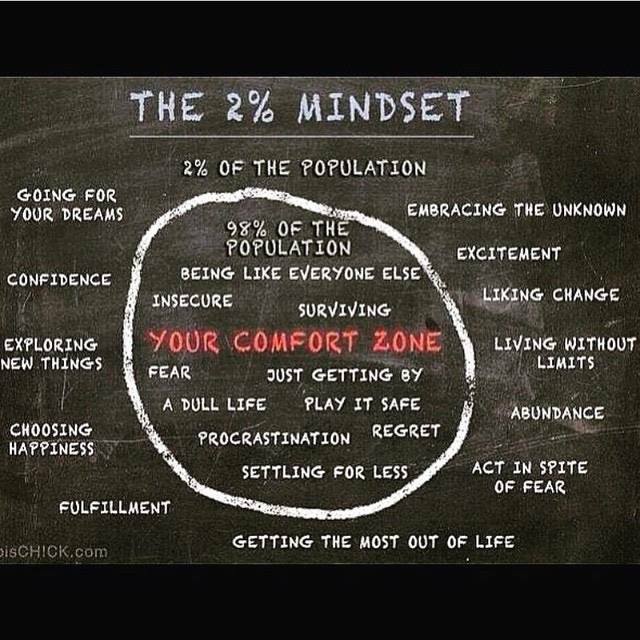 I suggest taking a look at the 2% mindset. Try getting out of your comfort zone. I recently spent a week in the Wind River Mountains with a group of 2%ers. I joined 14 successful executives who chose to get out of their comfort zones to join a group of people they mostly didn’t know, to hike, camp, cook, collaborate, and learn to trust each other for a week with the National Outdoor Leadership School’s (NOLS) Executive Leadership Expedition. A number of these executives had never been backpacking before, and for many who had, it had been years. Each of them was looking for something new, challenging, and stimulating. Each was looking to learn and grow. We were a motley, but impressive crew – fifteen of us, nearly all in our 50s, eleven men and four women, with professional backgrounds ranging from a dentist, to a university professor, to a US Navy Admiral, to small business owners, to several CEOs, to Vice Presidents and other senior executives with a wide array of leadership and life experience. 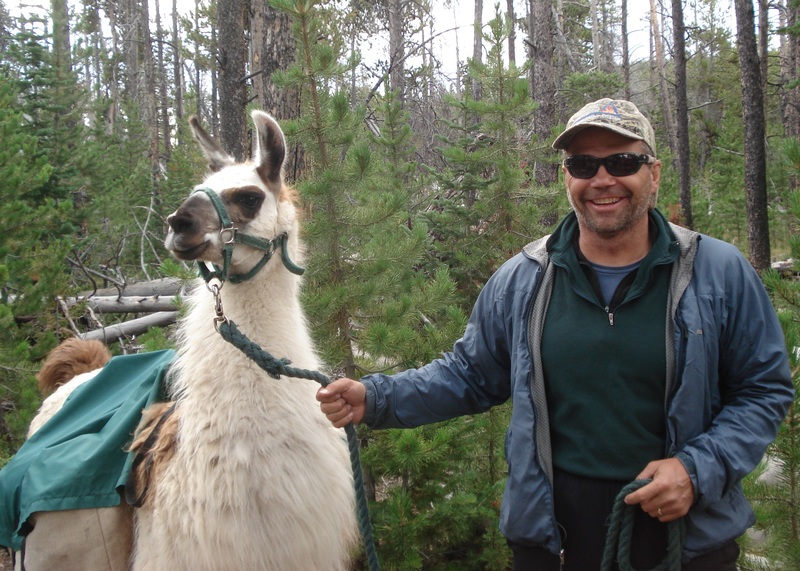 We also had seven llamas who carried much of our weight, keeping individual pack weights in the 20-30 lbs range. 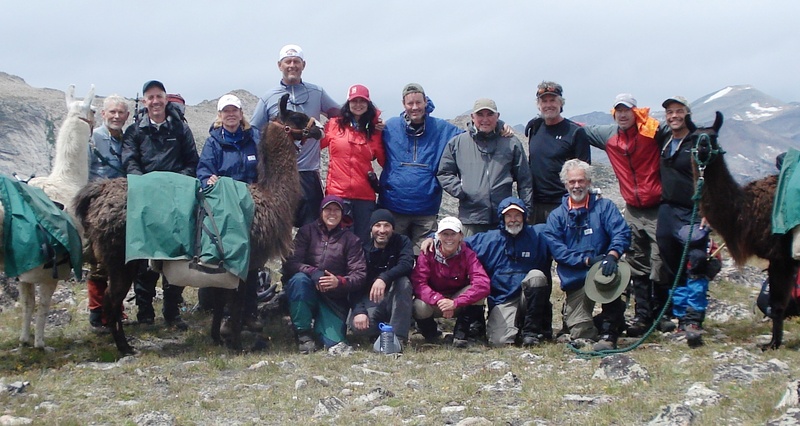 I was the junior instructor behind Rick Rochelle, our expedition leader with 28 years of experience leading NOLS courses on five continents, and Lynn Petzold, with 22 years leading NOLS courses all over North and South America. 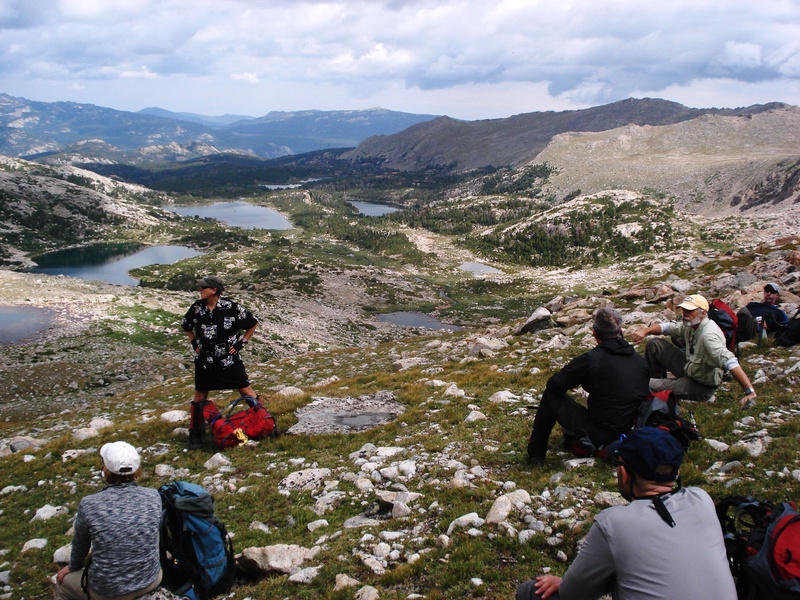 We “instructors” were part of the team, and were responsible for teaching camping and navigation skills, for helping to manage risk, and for making sure that NOLS and Forest Service policies were followed. People ask me, “So, what did you do out there for a week?” “What” we did was not the main point. Really. 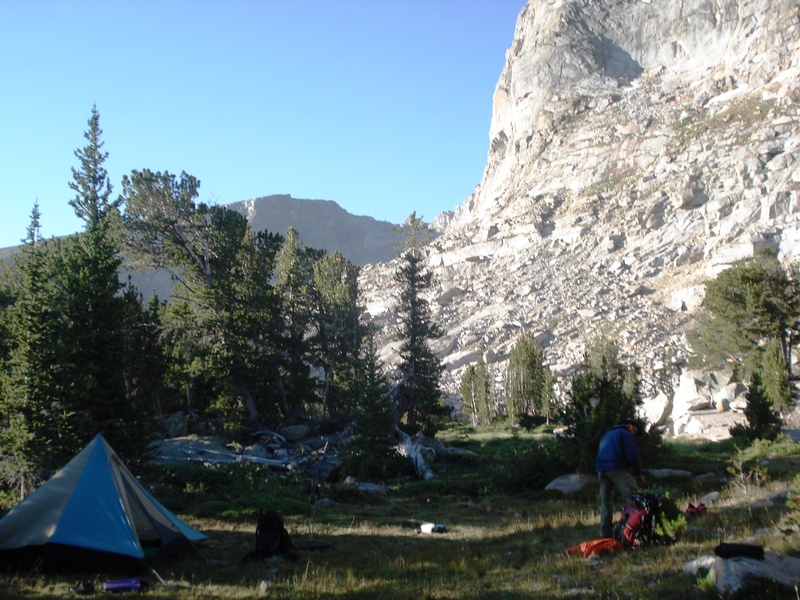 Unlike most NOLS expeditions, there was almost no teaching beyond basic camping, backpacking and hiking skills. The “What” was simple: We broke up into four small groups, hiked, cooked and tented together, and took care of each other, our llamas, our gear, and the environment. We had one layover day, which gave some of us an opportunity to hike up a nearby peak, or to swim in the cold lake, or to simply take it easy with unstructured time. Several in our group caught enough trout to make a great dinner that night for all of us. “Out there”- the setting for this expedition – is spectacular and primal. 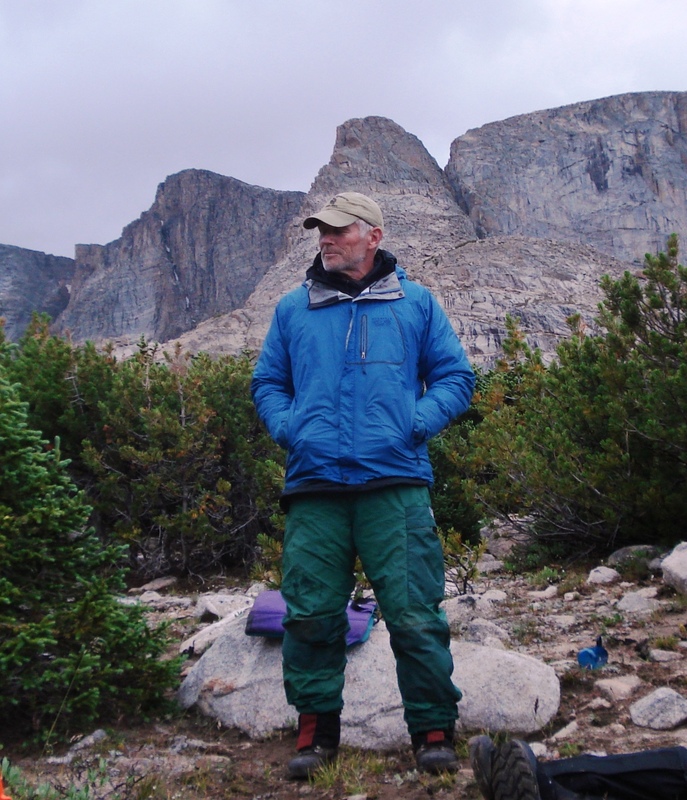 The southern Wind River Range in western Wyoming was our “classroom.” As one in our group said, the Stough Creek basin where we spent much of the expedition, is like Yosemite Valley, with sheer granite walls thousands of feet high, but without all the people. No roads or mechanized vehicles are allowed in the wilderness of the Wind River Range. 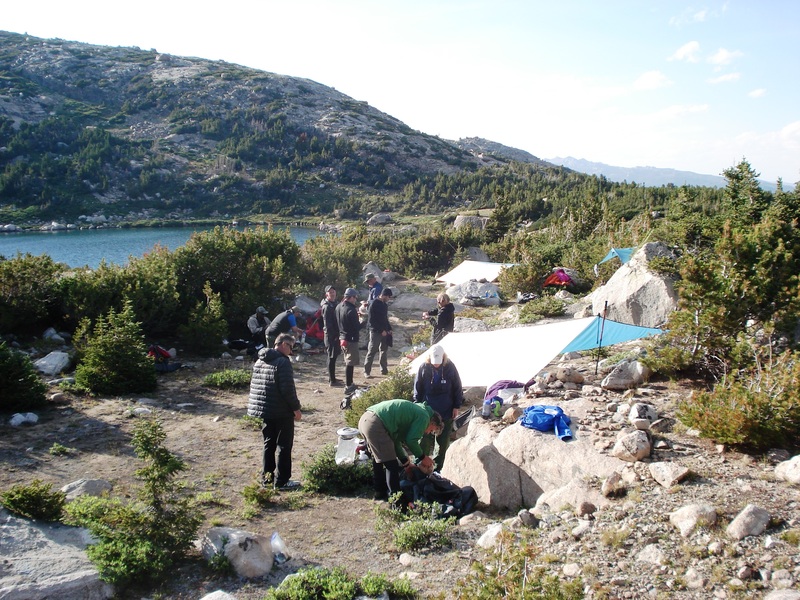 We camped near or above the tree line, among the mountains, clear streams and lakes. Moose grazed near two of our campsites. One of our expedition members, Rob Nielsen, CEO of All American Leadership, remarked that he was amazed at how quickly we built trust within our group. He works with corporations that strive for months and years to achieve the level of trust we developed in a week. Each of us was given 15 minutes to share our personal “Leadership Journey.” What were the key experiences that made us into the person and leader we have become? What is truly important to us? Just 15 minutes. These personal stories became a centerpiece of our expedition. We also laughed a lot. One tent group laughed together so long into the night that the rest of us threatened to climb into their (tight) 4-person tent and join in the fun, if they didn’t calm down and let us sleep! Every expedition has its defining humorous anecdote – last year’s had to do with a porcupine. This year, Rick Rochelle turned to check on llama Arapahoe and suddenly, unexpectedly, and seemingly without provocation, got spit on, full force right into his face, from six inches away! I didn’t see it happen, but I did see Rick momentarily lose his famous equanimity and splash Arapahoe with some of the water he was using to clean the chewed-up grass from under his eyelids! Then, Rick spit back! Arapahoe couldn’t have cared less. I’ve never seen a llama spit at a camper – or vice-versa. Rick assured us – it is NOT pleasant! This was my fourth Executive Leadership Expedition. This expedition, and this group of people, has renewed my energy and enthusiasm for this project. The project is simply this: To create an opportunity for middle-aged executive 2%ers to experience the challenges and the rewards of a NOLS expedition, tailored to meet their unique circumstances, backgrounds and time limitations, in the spectacular setting of the Wind River Range. A number of these 2%ers came primarily for an outdoor adventure, or to just get away from the grind – and that was fine. As we quietly sat in the bus, heading back into the front country, back into the vortex of emails, cell phones, meetings, and our many other responsibilities as leaders in our communities, all realized that we had gotten so much more than a backpacking adventure out of this intense, shared experience, with great people, in a breathtaking setting. I will be back…. Anyone who may be interested in finding out more about this expedition for next year or in the future, click here and/or shoot me an email and I’ll put you on distro for information as it develops. Our “kitchen” on our layover day above the tree line. Lynn and a group of us looking down on Stough Creek basin. One of our campsites, tucked into the cliffs. 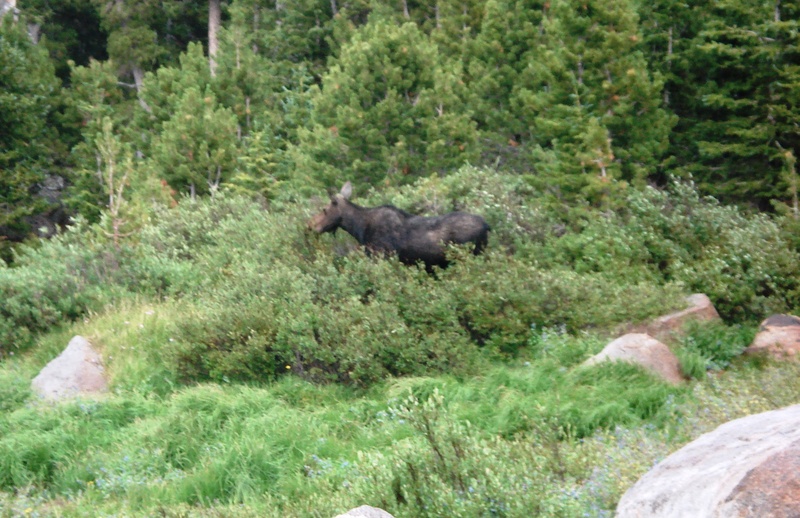 A moose grazing near one of our campsites. Rick trying to make up with Arapahoe – who couldn’t care less…. We gathered for a group pic as we came together at a mountain pass. Thanks, Bob! As usual, you cane along at the right time. Busy, busy, being grandmother support for our newest grandson, Jack, born last Thursday night. Unexpected c-section makes this a bigger mission. All is well, mom and baby are fine; dad is a great guy…and so eager to be in the lead! 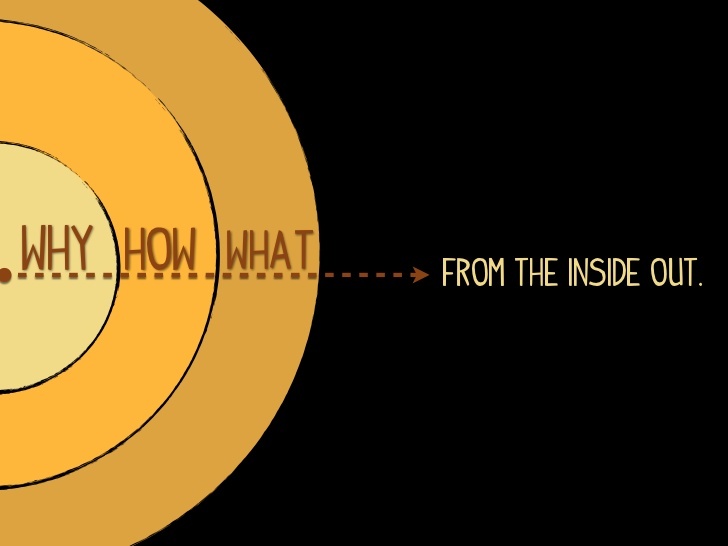 Not surprised you referenced Simon Sinek. Mike and I spoke to the newest class if BGen and SES Air Force officers and spouses regarding leadership. Sinek followed us on the podium, so we met him then stayed for his talk. Impressive! So glad the NOLS group performed greatly, as always. I am helping new mom and dad trek into the wilderness of parenthood…pray for us all! You could not have more accurately outlined the essence of this unique life experience. First, this was the longest period that many of us had been without a connection of any kind to the outside world in decades. And as you mentioned, I was amazing how this remote crucible could take so many relative strangers and inspire the camaraderie, intimate bonds and deep trust that many teams work years to achieve, if in fact, they ever do. Being reliant on each other to prepare meals, set up and break down camp, and care for, pack and lead the animals was work. Add to that providing support and encouragement to each other during long hiking days over rough terrain, often cross country without the benefit of marked trails, is CHALLENGING! (Not to mention significant elevation gains, thin air, rain, wind, cold and heat!) Given the diversity of backgrounds and technical backcountry skills, the potential for friction, impatience and failure was very real. But as Bob points out at the beginning of his piece, the WHY of it all precluded any of those negative outcomes from happening. While the granular description of each persons WHY may have differed slightly, we were all there for a challenge, and to stretch significantly beyond our day to day lives. In that purpose, we were united. In that stretch, I believe that each of us consciously (or unconsciously) chose to do a bit more than ‘our fair share’. Each of us went beyond our 50% percent in relationships and relationship management, to create something more than 100%. We listened a little bit better, paid more attention to our actions, our surroundings, our impact, and demonstrated greater empathy. This community consistently demonstrated ‘Expedition Behavior’, became a team and together leaned forward into every challenge and mishap that presented. Through the overcoming of these significant challenges and hardships together, I believe the bonds of deep trust were forged. The one side benefit of this expedition that Bob didn’t mention are the lifelong friendships that have been established. And while my back and feet are just beginning to recover from their weariness, my spirit is already looking forward to another similar adventure both with my new friends, and with others I’ve not yet met. Rob, it’s interesting that you say, “Each of us went beyond our 50% percent in relationships and relationship management, to create something more than 100%.” Regarding expedition behavior, Founder of NOLS, Paul Petzoldt said, “If you think you are doing more than your share, you are probably doing just enough!” I used to joke with adolescent mountaineering students: “You don’t have to love each other. You just have to trust each other with your lives!” Hear, hear on developing lifelong friendships. Mary, it’s great to hear from you! Please give my best to Mike and Jay. What a great expedition, save the llama spittle! that looks like a fantastic trip. this NOLS trip has been on my list for many years. time to make it happen! http://www.nols.edu/nolspro/custom_courses/executive_leadership.shtml Shoot me an email if you’re ready to discuss. Would love to have you on join us!